Another day, another skirt! My new favorite clothing piece is this maxi skirt with a yoga waistband I whipped up. Please forgive the lack of pictures...I made this so fast I didn't think to take pictures! - 1 1/2 to 2 yard of stretchy fabric. Mine is a polyester type fabric remnant I scored from the LA Fabric District. Step One: Lay out your fabric, folded in half. 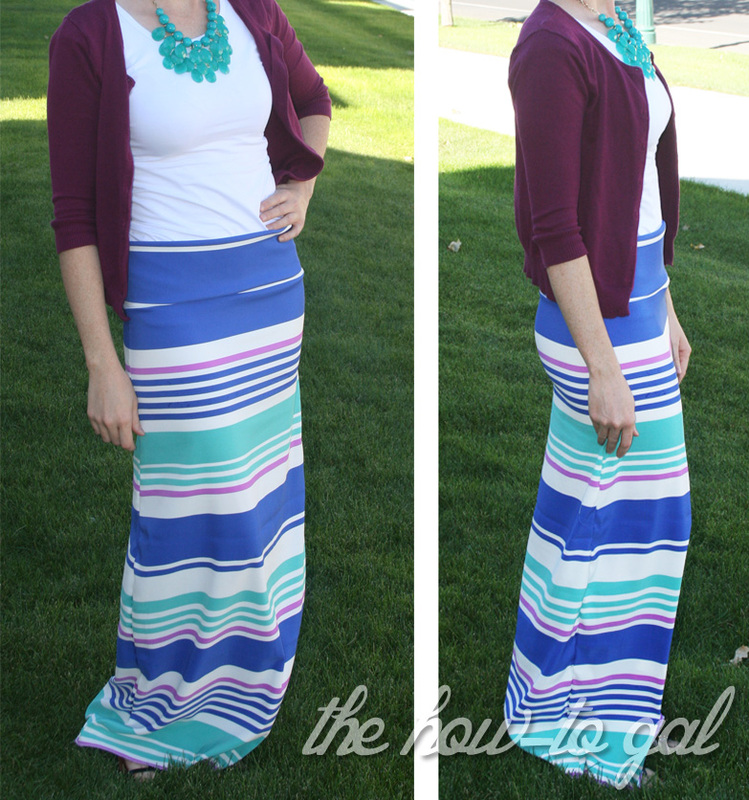 Find a maxi skirt whose shape you love and use it as a pattern. Step Two: Cut around one side of your maxi skirt, giving yourself 1/2 inch extra for seam allowance. Step Three: Fold the cut side over and cut out the other side. This will ensure both sides are exactly the same. Step Four: Turn your fabric pieces so the right sides are together. Pin and sew them up. If you don't have a serger, I recommend sewing up the sides with a straight stitch and then zig zagging the edges to prevent fraying. Step Five: For the waist band, I used this tutorial from Make It and Love it (Again, I love her tutorials! Why beat a dead horse when a perfect tutorial is already out there?) I used the same fabric as my skirt because it was stretchy enough. You may need to repurpose a knit shirt like Ashley did. Step Six: Try on your dress and hem according to your preference. I like my maxi skirts touching the ground, so I simply zig zag stitched the bottom to prevent fraying and called it good. Love your posts :) Thanks for sharing! I'm a new follower and this post just made my day. I can't sew,yet,but this sounds super easy. I'm bummed my tutorial didn't make it into your list. On the make it-love it tutorial did you do the gathering at the top of the skirt as it showed? your skirt doesn't look like that at the top so I wanted to ask. I didn't gather the fabric at the top like Ashley did on Make-It Love-It. But if you were making this for a little girl, or you didn't cut your waist small enough, then yes, you would want to gather it. OMGsh! THANK YOU THANK YOU THANK YOU to for posting the info about shirring or using elastic thread on a drop in Brother! I've been losing my mind trying to get this done! Problem solved! YAY! Nope it doesn't! I didn't use knit fabric for this project though so zig zagging was necessary. 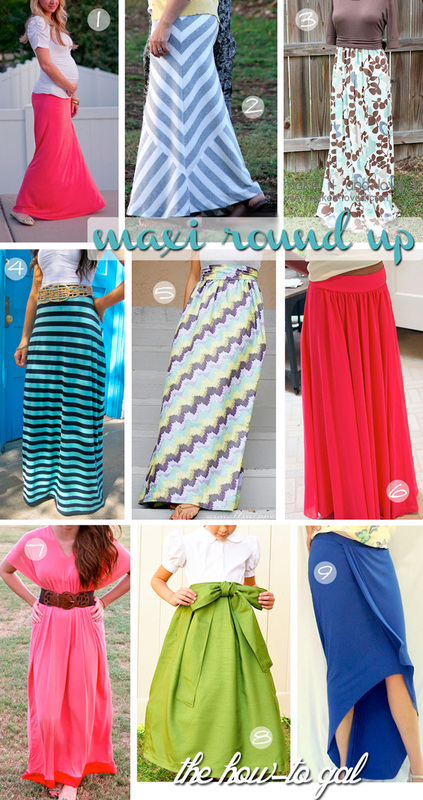 Any suggestions if you don't already have a maxi skirt to use as a pattern? I mean, if I already had the skirt, I wouldn't be needing to make one lol!